Precipitation, the liquid and solid water particles that fall from the sky, is part of a large and truly amazing cycle of water. It passes from the bottoms of the seas to the tops of the mountains, from the heights of the sky to the depths of the earth. Changing water’s form from gas to liquid to solid, weather drives this water cycle that is the heart of the possibility of life. Notice this: When scientists look for signs of life on other planets, one of the first things they look for is a sign of water. Sure, they’re inconvenient, all of these storms. Hey, no planet is perfect! The atmosphere takes up water from out of the warm, salty ocean and delivers it cool and fresh to the land through precipitation of storms. The chilling cold of winter stores it in the mountains as snow and ice. The warming spring brings some of it down the rivers and into the lakes. Over the following days and months and many years, the fresh water flows back to the salty sea. One way or another, all of the water you drink — and everything else you drink — and all of the food you eat depends on the storms, recent storms or storms of the distant past. Figure 1 illustrates the basics of the water cycle. 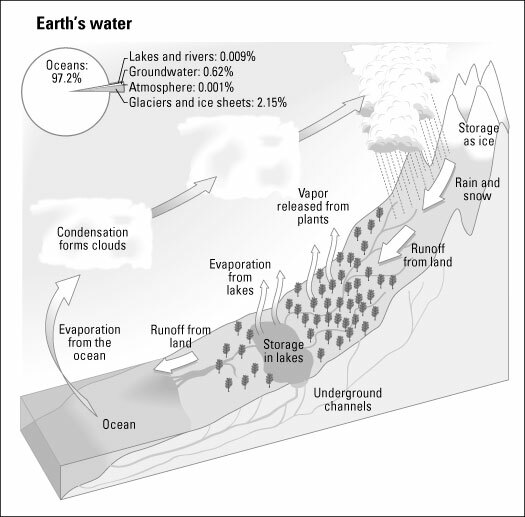 Figure 1: The basic elements of the water cycle. The water cycle is constantly transferring the world’s water supply between these basic storage reservoirs: the oceans, the land, and the atmosphere. The salty oceans contain 97 percent of Earth’s water. This means that on any given day, only 3 percent of the water in the world is fresh water. A whopping 75 percent of it is locked away in glaciers and ice sheets. Most of the rest — 24 percent — is what is known as groundwater, stored as soil moisture, as seepage in rocks, or in underground reservoirs called aquifers. Rivers and lakes hold only .33 percent — a third of one percent — of all freshwater. The atmosphere contains only .035 percent of all fresh water. The good people at the Go Figure Academy of Sciences have done the math. Amazingly, all the water in all of the lakes and rivers, all of it down in the ground and up in the atmosphere — the whole shebang amounts to only about 1 percent of the water in the world. This 1 percent supplies all of the rain and all the snow that the weather throws at you and meets all the daily needs of life. Driven by the heat energy from the Sun, water is cycled between its three phases or physical states — liquid, gas, and solid — in its journey between the oceans and other bodies of water, the atmosphere, and the land. The cycle is a continuous loop, of course, although some parts of it occur in only a matter of minutes, while other phases of the process drag on for thousands of years. The following sections outline the major steps in the water cycle. Water leaves the ocean and becomes part of the atmosphere by being transformed from its liquid state to its gaseous form, known as water vapor, and leaves the briny salt in the sea. This happens through the process of evaporation. This change of physical form absorbs heat, storing away a bit of the Sun’s energy in the water vapor molecule as it rises up into the atmosphere. Not all of the briny salt is left in the sea. Some of the salt breaks out into the atmosphere, where some is carried aloft and eventually serves as the condensation nucleii. Water is evaporating from liquid into water vapor everywhere across the surface of the oceans — and across most continents, for that matter — all of the time. But it happens especially during the warmer times of day, and especially at the warmer places on Earth. Weather scientists estimate that of all the water that enters the atmosphere as water vapor, 84 percent of it evaporates from the ocean, and 16 percent from the continents. So how much water evaporates from the ocean every year? About 92 quadrillion gallons sounds about right. That’s 92,000,000,000,000,000. The region that contributes most of this water vapor to the atmosphere is the Tropics, the warm band around the Equator that receives most of the direct sunlight. In the Tropics, huge volumes of water vapor evaporate into the atmosphere. Bands of giant thunderstorms take shape north and south of the Equator. These storms irrigate the tropical rainforests of Asia and Africa. The clouds in the Tropics also form in big bands of storms over the warmest water near the Equator in the Pacific and Atlantic oceans where tradewinds converge. The five-dollar word for this area is the Intertropical Convergence Zone (ITCZ). A molecule of water vapor evaporated into the air will spend only about a week, or maybe ten days, in the atmosphere before it condenses and falls back to the surface as one form of precipitation or another. Its life in the atmosphere may be only a matter of hours if it becomes part of a thundercloud that develops rain or hail. Or it may become part of warm light rain called virga that evaporates back into the atmosphere even before it reaches the surface. It may fall as rain on a sizzling hot parking lot and return to the atmosphere in a flash. It may fall as snow on the top of a giant mountain and be there 1,000 years. A molecule of warm water vapor can rise miles into the atmosphere and travel far across the world. In fact, scientists say, it usually does. They have drawn a picture of how far a typical water vapor molecule travels from the point where it evaporated into the air. Going with the flow of the atmosphere’s winds, according to one study, it is likely to be carried 6,000 miles east or west and 600 miles north or south. So how much water vapor is up there? By some estimates, the atmosphere at any given time is holding up to 25 million billion pounds of water. If it all condensed and fell at once, the Earth would be covered by an inch of water. A lot of cycling is going on. In a year, the atmosphere produces an amount of precipitation around the world that is more than 30 times its total capacity to hold water. For much of the water vapor in the atmosphere, the journey back to the ocean is very direct. Most precipitation falls as rain, and most rain falls on the oceans. Weather scientists estimate that 77 percent of the world’s precipitation falls in the ocean. It stands to reason when you think about it: Oceans cover 71 percent of the planet’s surface, contain 97 percent of the water, and contribute, through evaporation, 84 percent of the water vapor to the atmosphere. And all of those storms in the Tropics produce an awful lot of rainfall. If you look on a map at the Tropics — that region 23.5 degrees north and 23.5 degrees south of the Equator — you’ll see that most of it is ocean. For all your living needs, you depend on the other part — on the other 23 percent of the world’s precipitation that doesn’t fall immediately back into the ocean. Your life depends on the water vapor that condenses into precipitation and falls on land, and on the time in the water cycle that it spends as fresh water before returning to the sea. In an average year, the weather delivers 30 inches of water that falls unevenly across the United States. From this 30-inch layer, just under 18 inches returns to the atmosphere by evaporation. About one-half inch seeps into the ground. And the remaining amount, not quite 12 inches, is the surface water that is flowing downhill in streams and rivers and stops for a while in lakes before returning to the nearest ocean.